Military Discounts On Top Brands at your favorite Marine Corps Exchange. Our Mission is You! $ 1139 . 99 Reg. $ 1189 99 13.3" MacBook Air ® with Retina ® Display & Touch ID ® Sensor • Eighth Generation Intel ® Dual-Core i5 Processor • 8GB Memory / 128GB Fast SSD Storage • Force Touch Trackpad • Intel ® UHD Graphics 617 • Up to 12 Hours Battery Life 1 Available in Space Gray MRE82LL/A New! $ 279. 99 Reg. $ 299 99 $ 349 99 Off Base QC35 II Wireless Headphones • Google Assistant Built-in • Bluetooth and NFC Pairing • Volume-optimized EQ • Adjustable Level of Noise Cancellation QC35 II $ 299. 99 Reg. $ 359 99 ION Robot Vac with WiFi & Voice Control RV750 Selection May Vary by Location ReMIX SAVE $ 50! Feb. 13 - 26 $ 999. 99 Reg. 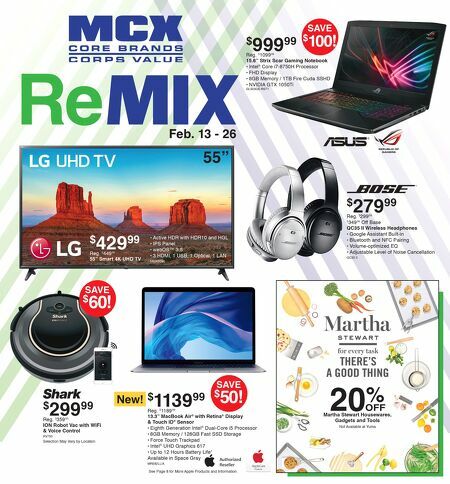 $ 1099 99 15.6" Strix Scar Gaming Notebook • Intel ® Core i7-8750H Processor • FHD Display • 8GB Memory / 1TB Fire Cuda SSHD • NVIDIA GTX 1050Ti GL503GE-RS71 20 % OFF Martha Stewart Housewares, Gadgets and Tools Not Available at Yuma $ 429 . 99 Reg. $ 449. 99 55" Smart 4K UHD TV • Active HDR with HDR10 and HGL • IPS Panel • webOS™ 3.5 • 3 HDMI, 1 USB, 1 Optical, 1 LAN 55UK6090 SAVE $ 60! SAVE $ 100! See Page 8 for More Apple Products and Information 55"